Statistic: A typical Grab n' Go mobile food service unit can effortlessly serve 75-100 people in less than 7 minutes! it takes to differentiate our mobile food service from the rest of the catering "pack" in Metro Detroit, Michigan, Ann Arbor, and Lansing, MI areas. Dependable, Delicious, and Dedicated are the hallmarks of Gary's lunch truck service. We retain our premier status by preparing, in-house, and delivering High Quality, Affordable Home Style Entrees, Market Fresh Sandwiches, Salads, Beverages and Snacks to area industrial facilities, business and office parks, movie and film sets (craft services), and new construction projects. All menu items are produced fresh daily in our 25,000 sq. 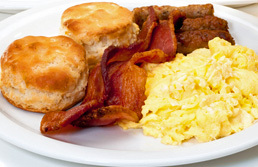 ft. food kitchen-commissary to ensure top quality is maintained on all our fabulous selections. Try our service and you'll see the smiles on your employees' faces at the enhanced dining opportunities provided to them - all at no cost to you, their employer! Our catering service operates with no subsidies from our clients! 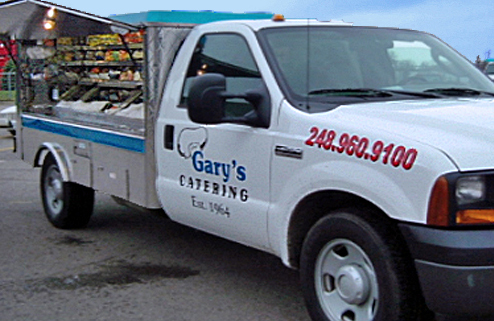 With our multi-level management team, Gary’s Catering has the ability to respond to plant shift and location modifications instantly, and depending upon our customer needs, station several points of mobile service within your facility or factory and provide evening, night and weekend service. Our catering truck service further enhances any existing food vending program you have in place allowing employees in the far reaches of your facility to have the same options as those found at the nearest store, vending location or café . Gary's Catering also services large scale events such as car & equipment auctions, festivals, softball tournaments, plus various corporate and business outings. Our trucks service all of the Metro Detroit, MI area. Email: Use the Contact Form at the right side to email us. Courteous daily delivery to your facility; rain, snow or shine! 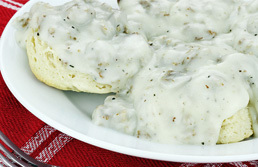 Gary's Catering - From our kitchen to your door! Note: Entrees are sold by the piece or by 1/3lb scoop. We Accept Credit and Debit Cards !